Wanna do something fun? Let's do something fun! It's time for our first foray into a thrifty, and absolutely fabulous project together. 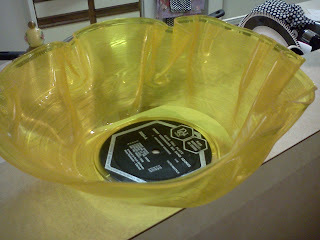 Vinyl records are nostalgic, retro, sleek, shiny and cool. I have a record player, but, you might not. You might, however, have a big box in the attic full of Elvis, the Stones, maybe Frank Sinatra.... and for whatever reason, might not be ready to part with them. I do have a great idea for you... and it's either free or wouldn't cost you more than a buck! Grab those records from your attic, OR get yourself to the local Goodwill or Salvation Army where you can pick up a record for $.50. Grab your cookie sheet, a couple of metal or glass bowls, turn your oven on to 200' and let's do this! Step one: Preheat your oven to 200'. And turn on your vent... the fumes are minimal, really, but, best to turn it on. Step Two: Get yer bowls (the 2 bowls should be similar in size) and cookie sheet out. Step Three: Grab yer record and place it on top of one of the bowls. Step Four: Put them in the oven! 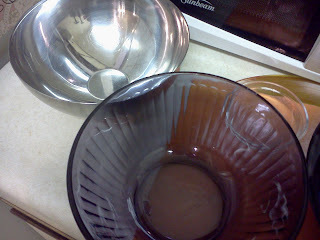 Step Five: Watch and wait. It doesn't take long. Could be as little as 2 minutes, as many as 5. 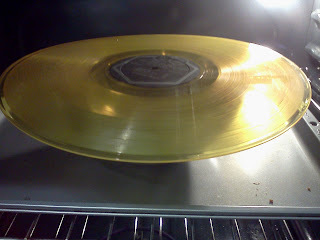 You'll know it's time when the vinyl begins to get all warp-y and wonky. Step Six: Remove everything from the oven, place the second bowl over the record and press down. 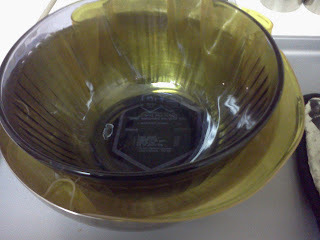 The bowl will sink with the soft vinyl into the bowl underneath. Like so! Step Seven: Take the record bowl out and let it cool. This literally takes mere seconds and voila! You can use these for almost anything. Mine are on a table near the front door as a catchall for keys and such and one holds our various remotes. 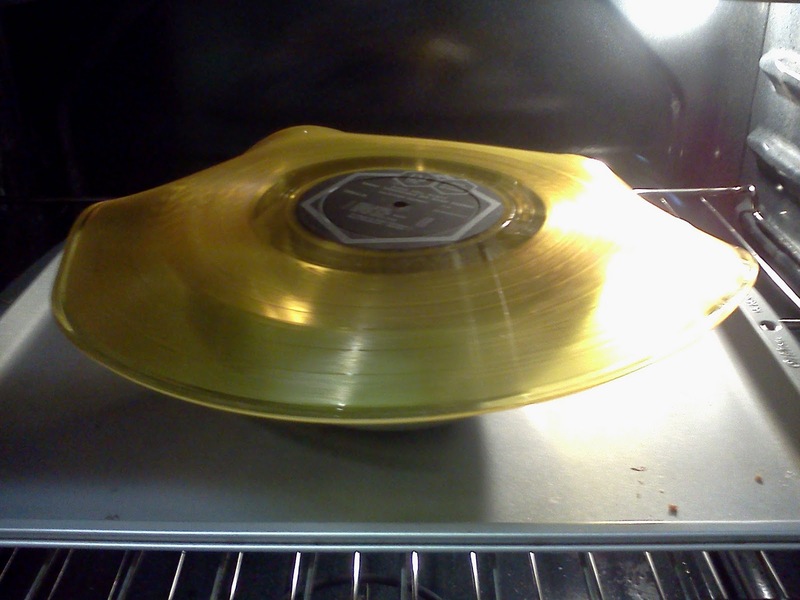 Being record vinyl, I wouldn't put food in them. Maybe something with a shell or peel, otherwise, no. But, lined with a cloth napkin it would be a great chip server! Really, the possibilities are endless. So are the ways you can tweak these to your individual tastes! I use the bowl in bowl method, but you can shape these by hand, arranging the "ruffles" to your liking... or, using another, oven safe, shaped dish. A small square cake pan, for instance, turned upside down and shaped by hand, would be great looking. 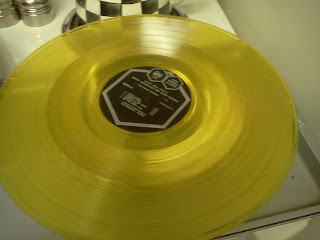 I've shown colored vinyl here, but, obviously, regular black vinyl records are excellent, too! Have fun! Be creative! There's really no right answer here, and very little to lose. For more by Elizabeth, be sure to visit her at Chandelierious and on Facebook, too.